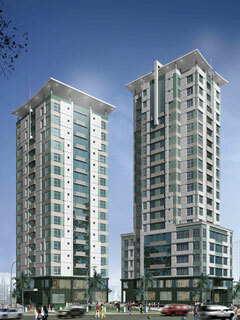 Khai Hoan Apartments Hotel is surrounded by a well known and bustling service and economic centre in Ho Chi Minh City. The Apartment Hotel is situated at the convenient location of 624 Lac Long Quan, District 11 in the centre of this thriving area. Khai Hoan serviced are not just fully self contained, but also have a distinctive and elegant style that makes the most of their beautiful surroundings. Guests staying at our apartment hotel can certainly look forward to enjoying high class services and facilities, whilst remaining very close to the city centre that is well known for its vibrancy. In addition to the basic accommodation that can be expected out of our apartment hotel, guests can also expect a vibrant lifestyle at a strategic location that is beautifully nestled between important service and commercial centres of Ho Chi Minh City. They also offer a tranquil and relaxing environment to come home to so that you can enjoy the benefit of living in the city without the stress. The proximity of our apartment to the city and business districts allows you to have the perfect balance between works and play while staying at the Khai Hoan Apartments Hotel. Khai Hoan Apartments Hotel is built in a way to accentuate the beautiful environment that surrounds it. In fact, the hotel comprises of two symmetrical buildings and each of these buildings compliments their surroundings perfectly. There are 45 separate in each of the buildings with 3 in allocated to each floor. The size of these varies between 105m2 and 650ms2; largely depending upon the suite they are in. Guests can enjoy the luxury and convenience in all of our as they are well equipped with modern appliances like washing machine, gas stove, rain hood, advanced lighting system, microwave and refrigerator. So whether you are in the office, bedroom or luxury room, you can be rest assured that you can take pleasure in using our advanced and modern gadgets that are equipped in every room. All in all, guests can relaxed and revel in the perfect lifestyle made available at the Khai Hoan Apartment Hotel. The alluring decor and modern design that each of our service encompasses allows our guest to come home to the perfect relaxing environment. They are also the perfect place to entertain guests with our modern appliances. In addition to this, the serene atmosphere created in our apartment is the ideal contrast to the bustling Ho Chi Minh City. There are many exceptional services the residents of Khai Hoan Apartments Hotel can look forward to in order to remain comfortable in our . Residents at the Khai Hoan Apartments Hotel have plenty of leisure services at their finger tips to use around the clock. Some of these services include sauna, steam bath, Entertainment Park, fully equipped gym and playgrounds for children. If you think this is all we have on offer, then you are wrong. To go along with all these offerings, residents can get round-the-clock banking and shopping experiences at each of our service, reassured that every need and desire is catered for at the Khai Hoan Apartments Hotel where your comfort is our paramount concern.